Content matters. And we know that you put a lot of effort into crafting creative and engaging content. We also know that most writers don’t want to spend too much time on content administration. After all, writers are writers—not bureaucrats. However, there needs to be a way to make sure that only approved content gets published. ACME Corp is a telecommunications company that often needs to publish product pages for the mobile phones they are selling through their website. ACME Corp is on top of their game when it comes to writing great copy. 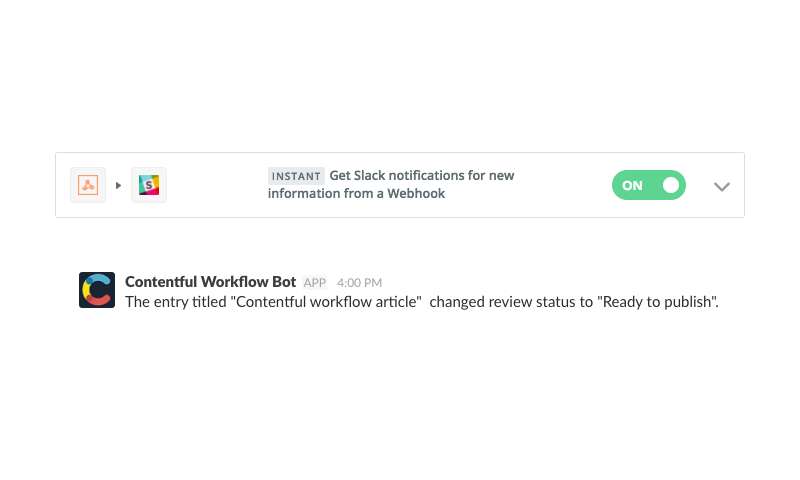 But the major problem is that they have no content approval workflow in place. Let’s fix that! Before you start, you need to set up your content model to describe the workflow status of the entry. Review State, shown above, is the field that indicates where in the flow the entry sits and promotes it to the proper views and channels based on this filter. Needs review: Set by the author when they have created a draft and wants it to be reviewed by an editor. Needs changes: Set by the editor when a draft gets rejected, and changes are needed. This setting can also be used for when an entry is live but needs to be updated. Ready to publish: Indicates that the editor is satisfied with the content and sees it fit for publication. The Approved by Legal checkbox is required and must be ticked by the legal department before publication. This will prevent an editor from accidentally publishing an entry before any potential legal implications have been sorted out. Any organization needs to make sure that only certain people can publish content and/or edit the Review State fields. Lastly, you can leverage the saved views functionality to make sure that each role can see the content they need to act on. Needs review: Search for reviewState : "Needs review" and save this as a new view. Both editors and legal will use this. Needs changes: Search for reviewState : "Needs changes" and save this as a new view. This will be relevant to the author that needs to rework some content. Ready to publish: Search for reviewState : "Ready to publish" & approvedByLegal : Yes and save this as a new view. This takes into account the legal department’s participation and waits for the editor to hit the publish button. 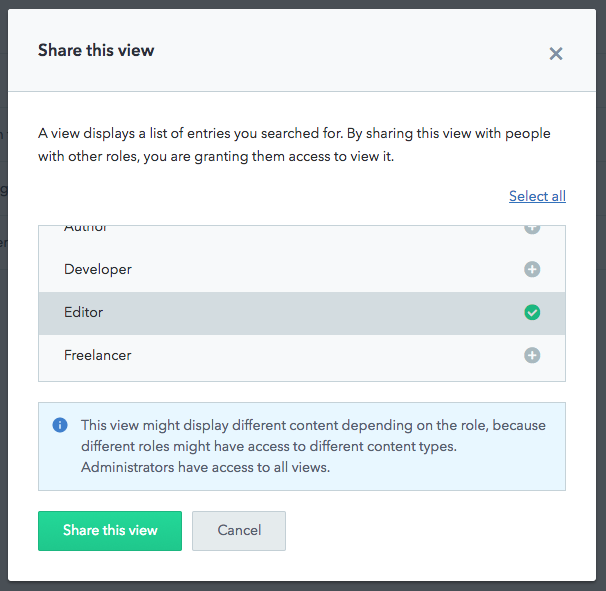 With the just released feature of assigning views to specific roles, you can also make sure that each of your team members can only see the view that applies to their workflow. New Entry: Triggers when an entry gets published in Contentful. New Asset: Triggers when an asset gets published in Contentful. Create Asset: Creates an asset in Contentful. Create Content Type: Creates a content type in Contentful. Create Entry: Creates an entry in Contentful. As there are changes in the field values, but not on the content state, you need to set up your webhooks to trigger on every autosave. Note that by default you will get a notification anytime a change occurs. This works well for smaller teams with a more modest amount of content. But as you scale, you will need to apply some throttling logic. In each step described above, and if you’ve enabled webhooks, a webhook gets fired so that you can, in turn, trigger your relevant notifications. 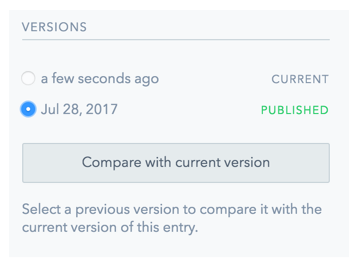 If the last two steps were not needed, but a change was still published, there is a quick way to revert this version to the correct, previous version by using our versioning feature. You can be very flexible with your setup. Almost everything is accessible from the API, which can support some strong use cases. For example, a busy approver like a hands-on CEO or a freelancer for the legal department can approve an entry directly from the preview environment without ever having to enter the Web App. Or they could also receive an email with the entry and approve it just by clicking a button within the email. You can't use this out of the box—you have to spend time configuring the content approval workflow. You need to do some manual work around your notifications set up with webhooks. This is a robust, suggested solution that will help you solve your content approval workflow problems. But we understand that there is, of course, room for improvement. That’s why we want your feedback, ideas, and experience. Your feedback will help us to evolve the support for custom content approval workflows. You can contact us in a number of ways. Using our Contentful Community forum is a great option, or shoot us an email at help@contentful.com or through our support page. Here's a list blog posts and documentation to help you learn even more about how to manage content.